Trisha + Jeff | Welcome! Family & Faces, General Post, Great Expectations, Happenings, Love Addicts, Marital Bliss, Momentous, Oh Baby! 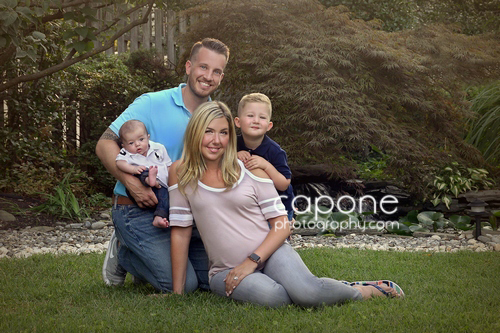 Trisha and Jeff, along with newborn Bryce and big brother Brayden, in Capone Photography’s outdoor garden. We love to document a family’s progress with outdoor, casual family portraiture. Thank you, Trisha and Jeff, for allowing us to be your family photographer!